Pustak Ka Vivaran : aaj ka yug vigyaan evan vishleshan ka yug hai, tark evan chintan ka yug hai. yahee kaaran hai kee saahity me vibhinn vaadon ka praavalay hai. in vividh vaadon ko ham saahity kee vibinn pravrttiyon kee sangya bhee de sakate hai. prastut hindee saahity aur vibhinnavaad pustak me hindee saahity kee unahee vibhinn pravrttiyaan athava…………. Description about eBook : Today’s era is an era of science and analysis, an era of logic and contemplation. This is the reason that there is a fate of various promises in the literature. These different promises can also be given the title of different trends of literature. 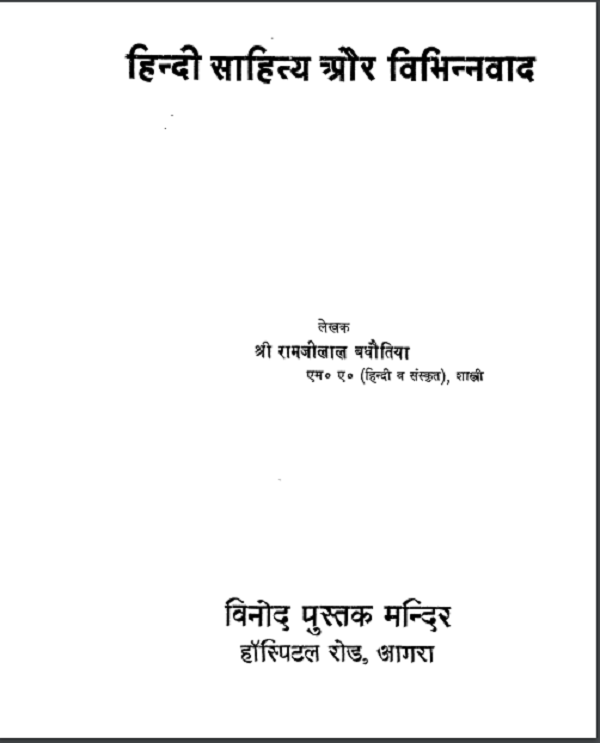 In Hindi literature and differentiations presented in Hindi books, they have different tendencies of Hindi literature or……………..